The town of Rethymnon on the north coast of Crete is a popular destination for visitors who want to venture away from their all-inclusive resorts for a bit of local color. The narrow streets of its old center wind between rows of narrow houses with balconies, often overflowing with flowers. Shops sell everything from made-in-China souvenirs to one-of-a-kind jewelry and handicrafts. It’s a pleasant place to spend an afternoon. 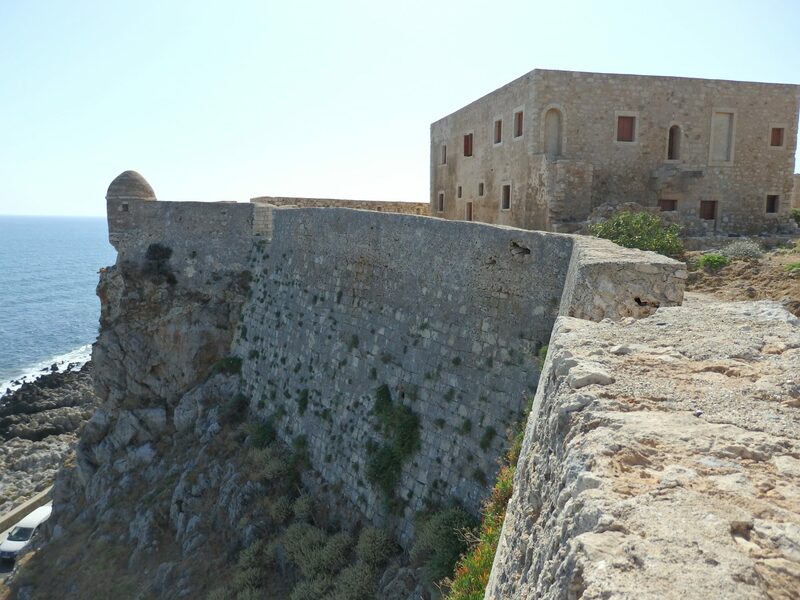 Rather than linger, however, I decided to explore the Fortress (Fortezza) of Rethymnon, whose walls still surround a point above the city. 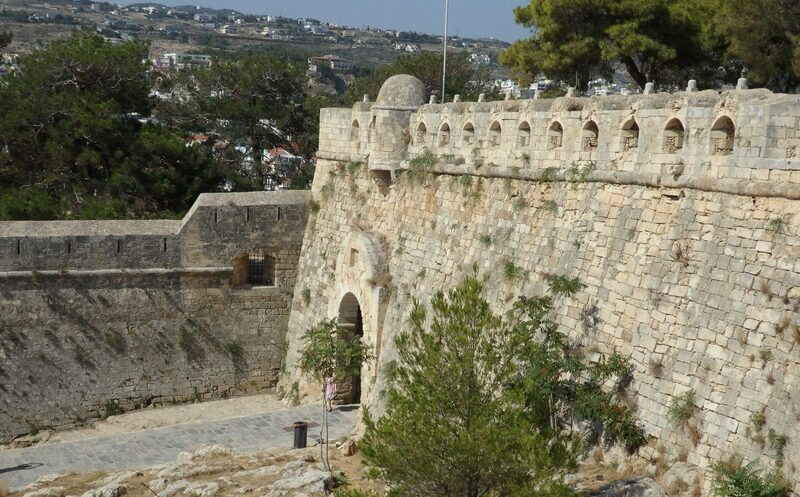 Dating from the 16th century, the Venetians built the Fortress of Rethymnon for defensive purposes. When the Turks took over in 1646 (I guess the defense didn’t go so well! ), they continued to use it and added buildings inside. Unfortunately, most of the buildings were destroyed in the 1960’s, though a few have been restored since then. This makes for a rather barren, empty feel once you’re inside the walls. Entering the gate and paying admission, you are free to wander around inside the fortress at will. Most people follow along the walls, peering through gun slits at the views of the city and the Mediterranean Sea. As the day heated up, I welcomed the occasional blasts of wind from the ocean at each opening. Following the walls, you’ll come upon little sentry posts in each corner of the bastion, where soldiers could keep an eye out for threats, and shoot through the slits if necessary. You’ll see some ruined powder magazines as well as the remnants of the Western Gate. A number of buildings still stand, including the House of the Councillors, home to a conservation laboratory. This view gives an idea of how the Rethymnon fortress walls tower above the sea. The building is the House of the Councillors. You can also see one of the sentry posts. The Armoury, the Residence of the Rector and the Complex of Magazines at the Northern Gate are all 16th century constructions in the process of restoration. All will eventually become exhibition spaces. It was not clear to me when I visited whether any of them is open yet; all were closed when I visited on a weekday morning. The most imposing building in the collection is the domed Mosque of Sultan Ibrahim Han, which stands in the middle of the fortress. 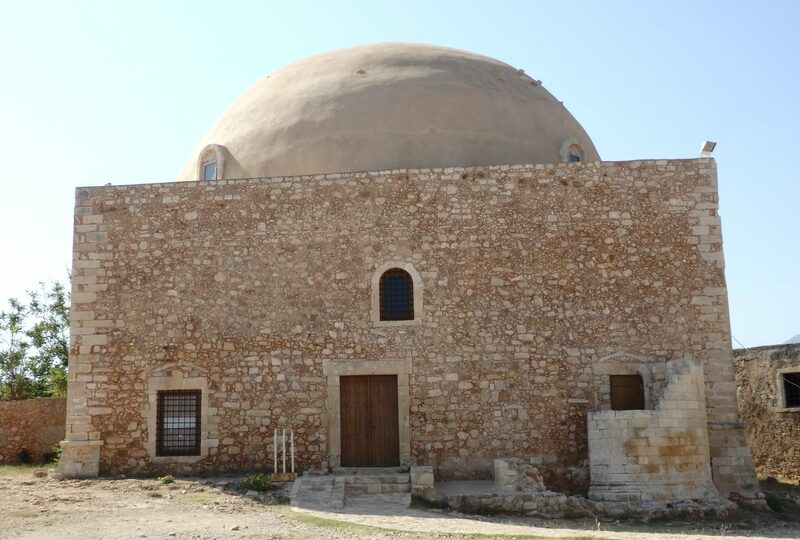 After they captured Rethymnon in 1646, the Turks built the mosque on the site of a Catholic church. Today musical events take place there. There are plenty of other things to see in Rethymnon besides the fortress, if you have more time than I did. I would have liked to see the small archeology museum just outside the fortress. The folklore and history museum, I would imagine, would be one of those obscure sites I particularly like to explore. I did manage a quick stop at the 15th century Neratze Mosque, now used for concerts and music lessons. 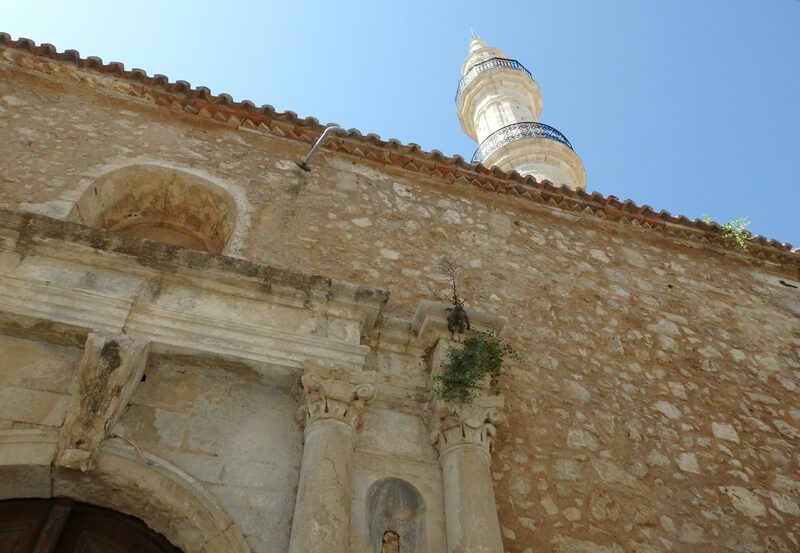 Originally a Venetian church, the Turks turned it into a mosque with the addition of a minaret and three domes after they conquered Crete. The minaret was recently and beautifully restored. I passed the Venetian Loggia as well. This well-preserved 16th-century building now houses a Ministry of Culture shop, where you can buy guidebooks and copies of Greek sculptures. A friend told me not to miss the Rimondi fountain if I explored Rethymnon. When I found it, I knew what he meant; it’s easy to overlook, surrounded as it is by shops and cafés. 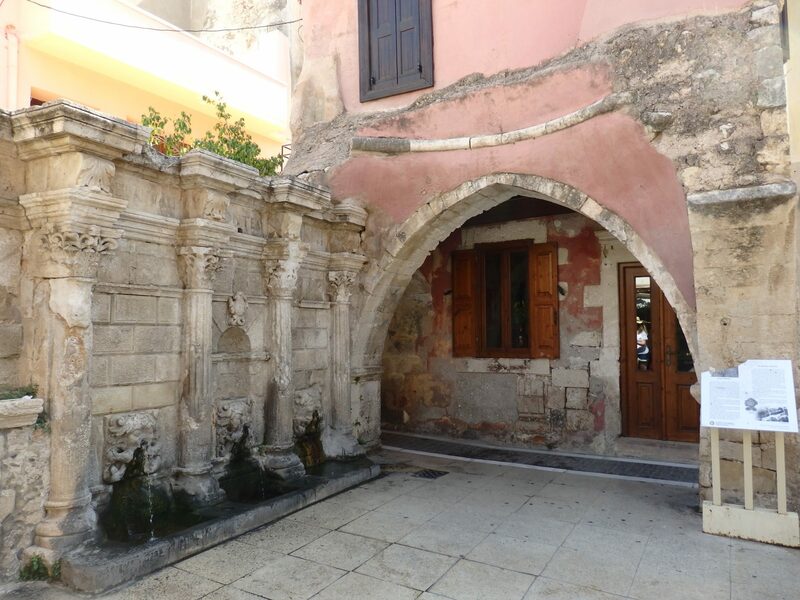 In the 16th century, the Venetians built a stone conduit from a spring a couple of kilometers away, and installed this little fountain in town because of a water shortage. You can still see the remnants of a vault that the Turks built over the fountain later. Rimondi fountain on the left, with its three lion-headed spouts still in working order. You can see the traces of the Turkish vault in the adjacent building. 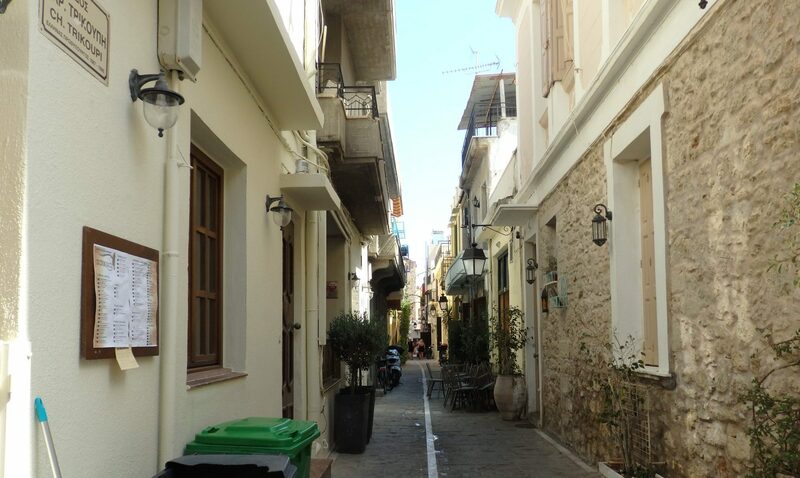 Have you been to Rethymnon in Crete? What did you see and do there? Add a comment below! I’ve not heard of heard of Rethymnon, let alone visited it! Love the Rimondi fountains and the Turkish influence. Neither had I! But Crete is definitely worth a visit. I love pretty much any Greek island! I am a history fan, so, I would have chosen to visit the fortress during a visit. The islands of the Mediterranean are so interesting and scenic. Would not mind spending some time hopping around. Yes, I bet the acoustics would be great in the mosque.